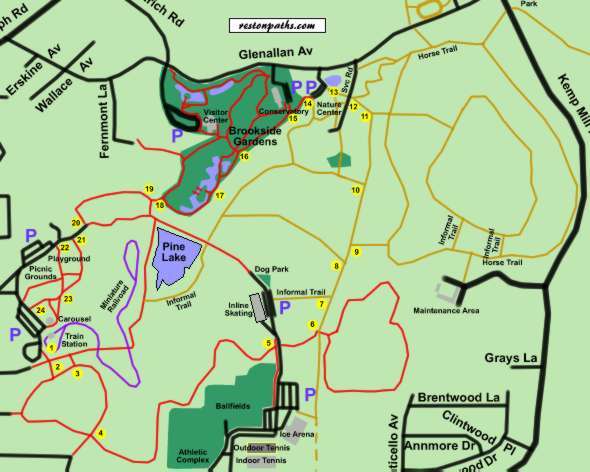 This walk is entirely within Wheaton Regional Park and includes a portion of Brookside Gardens and the Nature Center. It starts from the south side of the parking area accessed from Shorefield Road. After entering the woods the trail crosses a wooden bridge and ends at an intersecting trail. Turn left on the intersecting asphalt trail. The trail passes a utility hut on the left and a gravel path next to the hut. Stay on the asphalt trail as it turns to the right and proceeds up the hill. The trail intersects with an asphalt trail. Turn left onto the intersecting trail. After walking a short distance the trail will pass near a series of athletic fields on the right. A natural surface trail intersects from the right. Continue straight on the present trail. Again the trail marker indicates this is the direction to the Nature Center. A natural surface trail intersects from the left. Continue straight on the present trail. The trail marker points the way to the Nature Center. The trail splits. Turn left to follow the natural surface trail down the hill. The trail marker indicates this is the direction to the Nature Center. The trail crosses a service road for the Nature Center. The Nature Center building is to the left. Turn right at the end of the parking lot and follow the boardwalk passing through a gate in the fence around Brookside Gardens. The boardwalk turns left and intersects with a paved service trail on the edge of the gardens. Continue straight on the paved service trail with the fence on your left. Note: There are so many trails in the gardens and so much to see that this walk simply passes through a small portion of the gardens. See the Brookside Gardens section on this website for more information on the gardens. A paved trail intersects from the right. Continue straight on the present trail so that the ponds will be to your right and the woods to your left. Notice the Japanese Tea House on the island to your right. You may wish to make a brief stop here to view the turtles and large colorful fish swimming near the surface of the pond. The trail curves to the right. At the top of a hill a paved trail intersects from the left. Turn left and follow this trail through the pedestrian gate in the fence. Turn right onto the first asphalt trail. The trail marker will indicate this is the way to the play and picnic areas. The trail ends at a service road at the top of the hill. Turn right to follow the service road for a short distance. An asphalt trail intersects to the left next to playground equipment. Continue straight on the service road. The service road passes some rest rooms. Turn left onto the asphalt trail just after the rest rooms. The trail passes playground equipment on the left and wanders through a picnic area. Continue straight past adjoining trails to reach the parking area at the bottom of the hill. The carousel on the left indicates that you are back at the starting point for the trail.